The selection of seal materials typically requires a compromise between advantages and disadvantages. There are hundreds of different PTFE materials with a variety of fillers. Common fillers include glass fibre, carbon, graphite, molybdenum disulphide, metal oxides and various polymers. Each possesses different properties, appropriate for different applications and service conditions. Common to all filled PTFE materials are their improved resistance to wear and deformation. 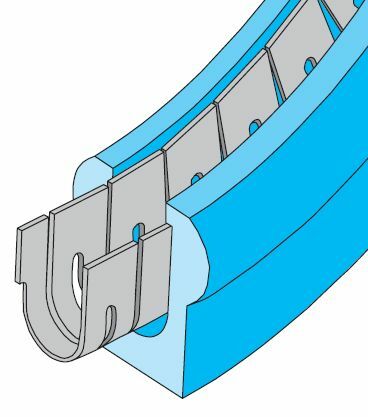 Unfilled PTFE provides, in most cases, a lower coefficient of friction than a filled PTFE material and the lowest degree of wear of the seal counterface. 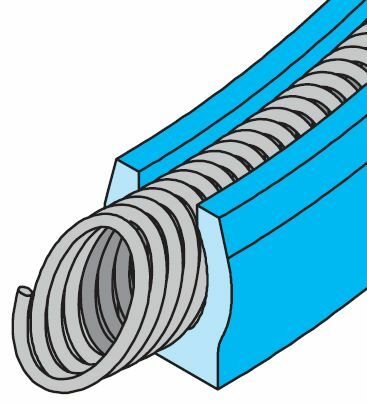 However, a sealing lip made of an unfilled PTFE material has limited resistance to wear and deformation under load. Selecting the appropriate material for the metal case and the O-ring(s) is also of significant importance to achieving satisfactory sealing performance. Contact All Seals for additional information. Special care must be taken during handling and installation of PTFE seals. The majority of PTFE radial shaft seals from All Seals are made to order to meet the demands of each application. There are, however, certain standard sizes within the ranges of approximately 6 to 200 mm (0.250 to 8 in.) shaft diameter and approximately 16 to 230 mm (0.630 to 9 in.) bore diameter. Contact All Seals for detailed information regarding designs and sizes. PTFE fillers don't act like elastomer fillers, which become chemically bonded to the elastomer. With polytetrafluoroethylene, the high shear modulus fillers are encapsulated and bound by the low shear modulus PTFE. 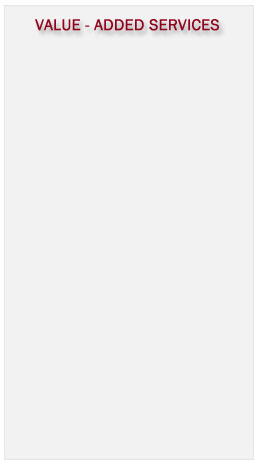 Glass is the most common filler for PTFE. Widely used in hydraulic piston rings, glass gives good wear resistance, low creep, and good compressive strength. Glass also has excellent chemical compatibility. The major disadvantage is that glass-filled PTFE compounds are abrasive to mating surfaces, especially in rotary applications. Molybdenum disulfide (MoS2) improves wear resistance and further lowers the coefficient of friction. ôMoly" is typically combined with other fillers (such as glass and bronze). Carbon (powder or fiber) imparts excellent compression (low deformation under load) and wear resistance, good thermal conductivity (heat dissipation), and low permeability. Carbon-filled PTFE compounds are not as abrasive as glass-filled compounds, but they are still more abrasive than polymer-filled compounds. Carbon-filled compounds have excellent wear and friction properties when combined with graphite. Carbon fiber lends better creep resistance than carbon powder, but fiber is more expensive. Graphite is a crystal modification of high purity carbon. Its flaky structure imparts excellent lubricity and decreased wear. Graphite is often combined with other fillers (especially carbon and glass). Bronze (a copper-tin alloy) lends excellent wear resistance and thermal conductivity. Bronze-filled materials have higher friction than other filled PTFE compounds, but that can be improved by adding moly or graphite. 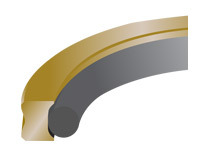 Bearing and piston ring applications often use compounds containing 55% bronze – 5% moly. Bronze-filled compounds have poorer chemical resistance than other PTFE compounds. Stainless steel supplies high wear resistance and load bearing capability, along with better chemical resistance than bronze-filled PTFE. Stainless steel is especially good in steam service. Wollastonite (calcium silicate) is a mineral filler giving properties similar to glass (minus the abrasiveness). The FDA has approved it for food service. PPS (polyphenylene sulfide, trade name Ryton®) was the first polymeric material used to improve PTFE's wear and abrasion properties. PPS-filled compounds also exhibit excellent deformation and extrusion resistance, making them good for use in back-up rings. Ekonol® is a thermally stable aromatic polyester. When blended with PTFE, it produces a composite material with excellent high temperature and wear resistance. Ekonol® will not wear mating metal surfaces, making it good for rotary applications. Ekonol®-filled materials are also good for food service. Polyimide is another polymeric filler offering superior wear and abrasion resistance. Polyimide-filled PTFE compounds have about the lowest friction properties of all filled PTFE materials, so they provide great performance in non-lubricated (dry) applications. They will not abrade mating surfaces (even soft materials such as brass, stainless steel, aluminum, and plastic). Polyimide is one of the most expensive PTFE fillers, however. Other fillers include calcium fluoride (CaF2), which is specifically used in hydrofluoric acid (HF) service, and alumina (Al2O3), which can improve the mechanical properties of compounds destined for high voltage applications. Alumina-filled compounds are very abrasive. Rulon ® is the Saint Gobain Performance Plastics tradename for a family of reinforced proprietary PTFE compounds. This unique family of materials offers the combination of high compressive strengths, low coefficient of friction, and excellent abrasion and corrosion resistance while running without lubrication. These materials are used in bearing and seal applications at temperature extremes from -400°F to +500°F (-240°C to +260°C) with or without additional lubricants. Rulon ® materials also have the unique property of no "slip stick" --- no erratic motion at low speeds. The best known, most widely used Rulon formulation. Rulon ® LR has a long reputation for high wear resistance, low friction, good electrical properties and chemical inertness. Not only does it make a great sleeve, flange or thrust bearing, it can also be bonded to nearly any surface to provide wear resistance and reduce friction. MAROON in color. This is the best Rulon grade for aluminum and soft mating surfaces. Rulon ® J provides the lowest coefficient of friction of all Rulons, and provides good wear and abrasion resistance. Because this grade is "all plastic", it can be run on non-ferrous and non-metallic mating surfaces such as 316 Stainless, brass, and other plastics. It is used in both bearing and seal applications, but is generally not suitable for use in alkaline or oxidizing acid solutions. DULL GOLD in color. This FDA compliant material was specifically developed for food and drug applications. Rulon ® 641 is designed to run dry without any moisture or lubrication. WHITE in color. This was the first commercially available reinforced PTFE and is still quite popular. Rulon ® AR offers the best combination of flexibility and load-carrying properties. It has high wear resistance, low friction, and good electrically insulative and chemical properties. Since, its fillers are ceramic in nature, mating surfaces should be RC35 or harder. It is and used in seals, piston cups, and some bearings. MAROON in color. A material for extremely heavy loads. Rulon ® 142 is ideal for linear bearing applications such as slideways in machine tools and heavy equipment, and may also be used in expansion joints and bridge pads. This material provides low friction, excellent unlubricated wear properties and good heat dissipation and is etched one side for adhesive bonding to the steel substrate. Rulon ® 142 competes with Busak+Shamban's Turcite ® B Slydway ® product. TURQUOISE in color with a bronze tint. This FDA compliant material is excellent for wet or submerged applications. Rulon ® 123 provides excellent service against soft and non-ferrous mating surfaces. BLACK in color. NOTE: Other specialized Rulon ® grades are also available for chemical environments, higher loads, severe wear, or custom applications. Contact us for more information! A quick product overview of Tetrafluor high-performance seals, rings, tubes, rods, skived tape and film, and other custom-machined components. A more in-depth product overview of Tetrafluor high-performance seals, rings, tubes, rods, skived tape and film, and other custom-machined components. Let us help you choose the best material and design from our large selection of high-performance, chemically compatible materials. Industry-leading MetaPlast seals are metallic-spring energized to ensure positive seating and exceptional performance in severe-duty applications. 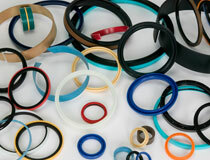 Custom molded or machined plastic seals and parts are the second part of All Seals's custom products division. We can produce custom seals and parts in various plastic materials such as PTFE, PEEK, UHMWPE, or Lubrithane. 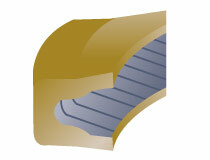 Machined plastic seals are used in applications where non standard designs are required for optimal seal function. 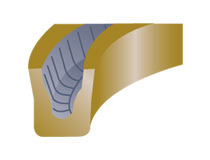 Rotary seal applications require dynamic sealing on rotating surfaces. An elastomeric seal with frictional contact high enough for optimal sealing without producing excessive heat and wear on rotating shafts under operating conditions. Rotary seals are designed for environments in applications such as: Gearboxes, compressors, mixers and dryers, presses, pumps, hydraulic cylinders, etc. Our team designs seals for your applications. Non standard piston and rod seals, valve seals or requirements for extremes in Pressure, Temperature and Operating life. An end face mechanical seal or mechanical face seal is a type of seal utilized in rotating equipment, such as pumps and compressors. When a pump operates, the liquid can leak out of the pump between the rotating shaft and the stationary pump casing. Since the shaft rotates, preventing this leakage can be difficult. An end face mechanical seal uses both rigid and flexible elements that maintain contact at a sealing interface and slide on each other, allowing a rotating element to pass through a sealed case. The elements are both hydraulically and mechanically loaded with a spring or other device to maintain contact. Bell jar and cylinder gaskets have an "L-shaped" cross-section. The bell jar sits inside the riser of the "L" and is sealed by atmospheric pressure pushing it down onto the horizontal surface. 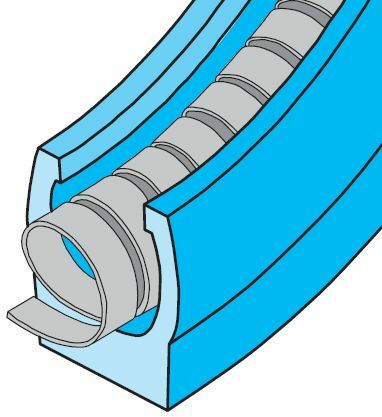 The lower side of the horizontal surface creates a vacuum-tight seal against the sealing surface (usually a baseplate, service well, or feedthrough collar). 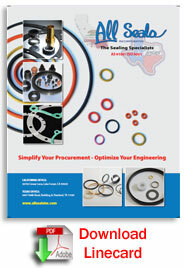 More information about Bell Jar Gaskets, click here! We serve a wide range of industries... When you have a sealing problem, contact us for the most effective solution.